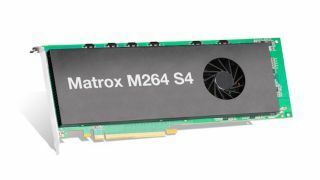 The What: Matrox Video has launched the Matrox M264 S4, a new addition to the M264 family of H.264 hardware codec cards. The Matrox M264 S4 card supports up to four channels of 4K Sony XAVC and Panasonic AVC-ULTRA encoding/decoding in a single-slot card to enable high-density, multi-channel 4K workflows in PC-based platforms. The What Else: Designed specifically for high density and quality, H.264-based encoding/decoding (Baseline Profile to High 10 Intra Profile up to Level 5.2), the Matrox M264 S4 card provides XAVC-certified and AVC-ULTRA-compliant presets. The Matrox M264 S4 card can encode/decode up to four 4K50/60 streams of XAVC 4K Intra Class 300/480, XAVC 4K Long 4:2:2, or AVC-ULTRA in real time with zero CPU usage. The M264 S4 card can also encode/decode up to four streams of 4K60 at 4:2:2 10-bit, 40 streams of HD Long GOP at 4:2:2 10-bit, or 64 streams of HD at 4:2:0 8-bit, with low power consumption in a small footprint. The Matrox M264 S4 card is supported by the Matrox DSX SDK, which features an extensive set of media processing modules—including file input/output, software codecs, and CPU effects—for rapid application and system development. The M264 family of codec cards also provides plugins for H.264 transcode acceleration into the FFMPEG framework. The Bottom Line: Combined with onboard de-interlacing and scaling functionality, the Matrox M264 S4 card is designed to provide a simple, cost-effective means of managing computationally demanding 4:2:2 10-bit, and 4:2:0 8-bit workflows. Broadcast OEMs can now deliver encode/decode performance using standard, PC-based solutions to enable multichannel broadcast contribution, distribution, and production systems such as video servers, IP multiviewers, media encoders, transcoders, render farms, and more. Matrox will demonstrate the M264 S4 card driving a variety of multichannel 4K XAVC workflows at its booth SL3811 at NAB 2019.